Well we didn’t leave Japan empty handed. In our usual fashion we showed up at the airport with our suitcases over stuffed and some extra carry on luggage. Everything is always colour coordinated! We also have that stack of books at the top left that will have to wait to be shared during another post. One of the most exciting finds were a set of Ryuji Mitani spoons. I came to Tokyo looking for anything made by Mitani and with the help of Yumiko we found this wonderful set. He is one of the most famous contemporary artisans in all of Japan and his stuff is really hard to get your hands on since the production is so limited. We put the desert spoons to use last night when we ate a whole mini tub of ice cream. 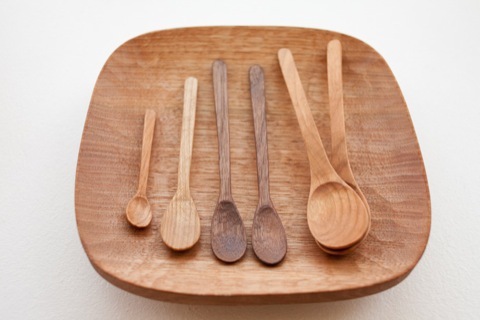 From left: spice spoon, baby spoon, coffee spoon x2, desert spoon x2. 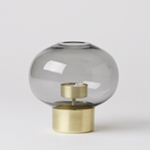 I wanted to find a similar tray to the one that Oji Masanori has on his website displaying his brass bottle openers. 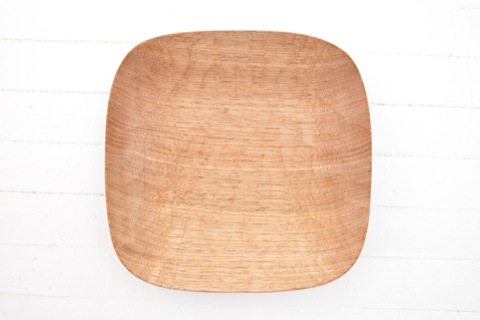 I found this beautiful tray at the Claska hotel shop by artisan Kazuhiro Yamaguchi. You can see all the little tool marks revealing that the piece was all done by hand. 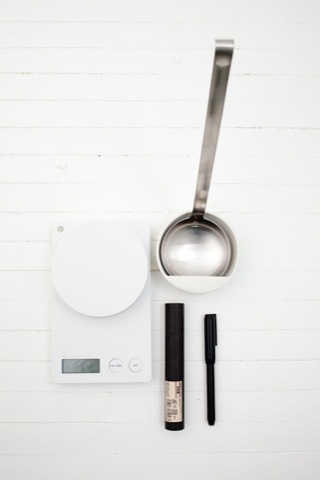 On the left are our Muji finds: The most beautiful kitchen scale we’ve ever seen, a wonderful ceramic ladle holder, and black pen designed by Naoto Fukasawa. Fukasawa also designed the paper pen/glasses holder in the photo to the right. 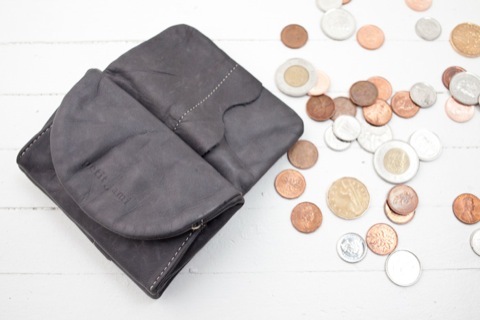 He designed the entire product range (SIWA), which we will be carrying at the store soon. 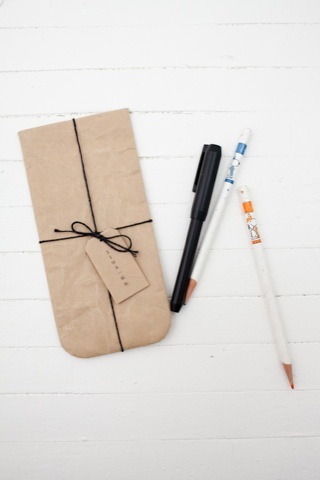 The pencil/glasses case is made from the highest grade shoingami paper, it’s super strong and gets softer with use. 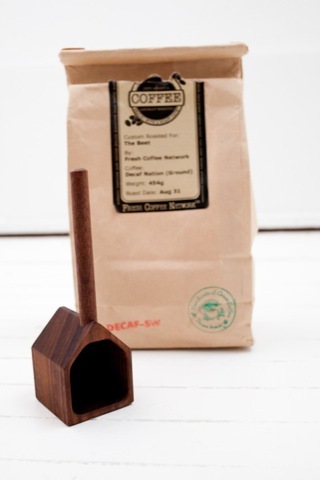 We found this quirky house shaped coffee scoop at Spiral. We can’t leave out the wonderful gifts we received during our trip! 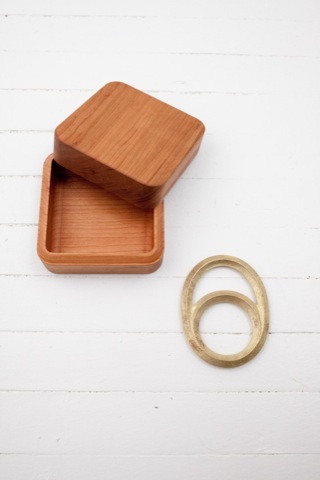 We got a beautiful cherry butter case, and brass bottle opener from Oji Masanori and his family. 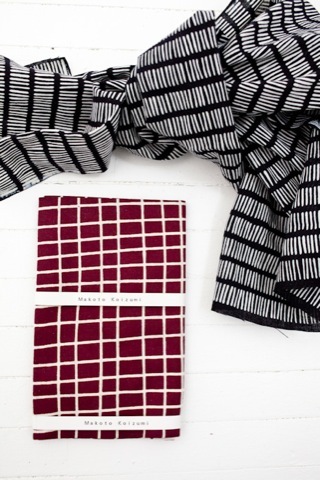 The multi-useful textiles are from Makoto Koizumi when we visited his studio. 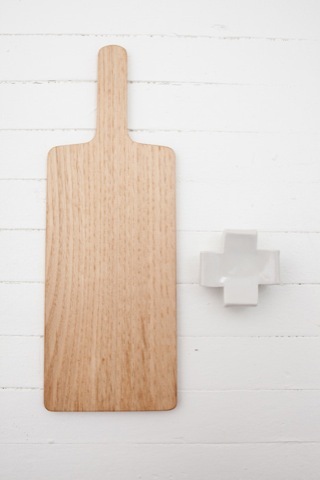 More great Claska buys on the left: A simple oak cutting board for cheese, and a beautiful ceramic cross by the artist ONZ. I had the shop keeper at the Claska right down her name, but I can’t seem to find the piece of paper! It’s a multi-use art piece that can be a spoon rest or paper weight. 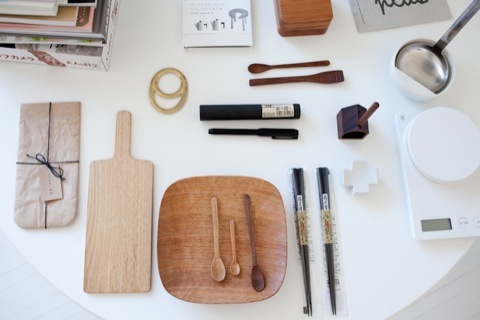 The chopsticks on the right are like the ones we used at Oji Masanori’s home. 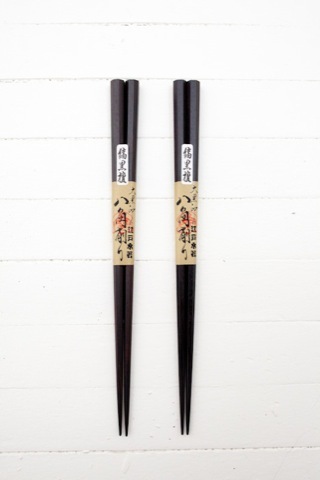 We are excited to get our order of brass chopstick rests in so that we can put these to good use! 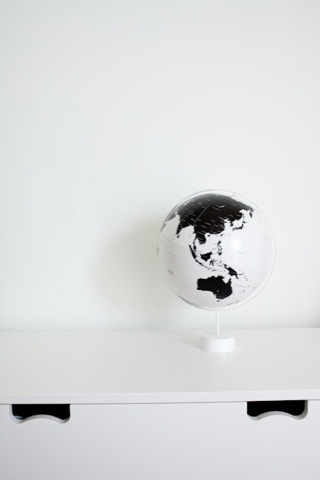 We found the Corona globe designed by Japan’s amazing design firm Nendo. 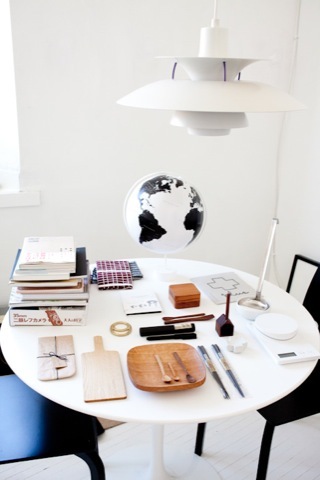 Did you know the founder of Nendo, Oki Sato is from Toronto? 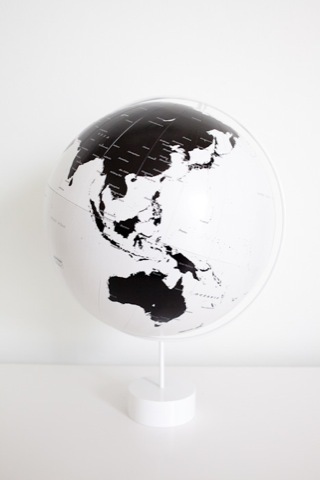 It was a pain traveling with it, but it’s the most stylish globe we’ve seen. The two things Juli said she wanted to get when she went to Tokyo were a new purse and a new wallet. Check and check. She got her beautiful leather bag from the Petit_Ami pop-up shop. 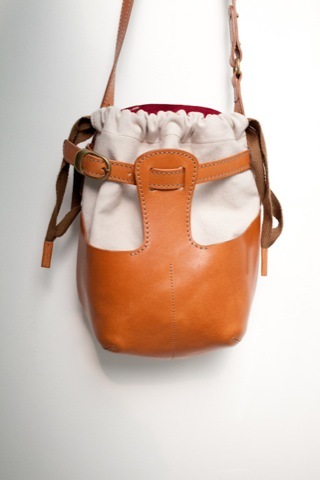 It’s a beautiful blend of canvas and buttery leather, with a hint of pink suede on the back. Plus lots of little pockets. 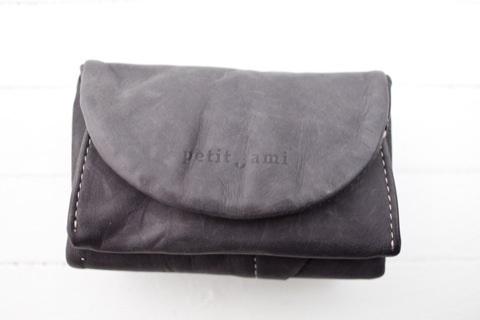 She also scored a super soft leather walled from Petit_Ami. All in all, we got some nice, classic treasures from our trip!